If you're investing in garden furniture or accessories, whether that's a new fence or a bin store or anything in between, then you're probably thinking about buying wood. By far the most common, and sensible, choice is to go for pressure treated timber, since this is likely to last the longest. 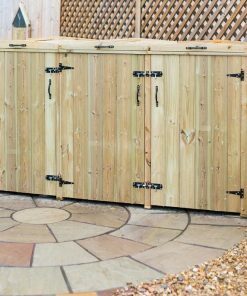 However, pressure treated wood is only durable in the long term if treated properly, and since none of us like wasting money it's important that you know exactly how to care for your new bin store. We're taking a look at all you need to know about pressure treated timber, so that you can make sure your new furniture lasts as long as you do! Shopping around for furniture (or even for wood for DIY projects) you'll see that you have a choice between treated and untreated wood. Untreated wood is exactly what it sounds like, just fresh, new wood. However, pressure treated wood has been through a process that makes it more long lasting. The wood itself is placed in wood preservative, and then put into a vacuum. The vacuum forces all of that preservative deep inside the wood, meaning it gets completely saturated and is treated even on the inside. This kind of treatment does two things. Firstly, it protects the timber against the damp, which in our climate is extremely important. This means that you can safely leave pressure treated timber outside, and even placing it in contact with wet soil is fine (though it's advisable to avoid this if possible). 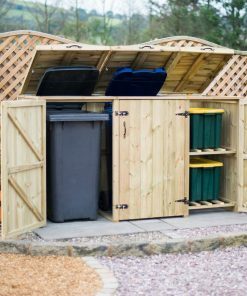 Secondly, the chemicals that are in the preservative will also help to protect the wood against insects, so you won't need to worry about critters eating your new bin store. Then Why Do I Need to Treat the Wood Further? Given that you've already paid a little extra for pressure treated wood that's supposed to be long lasting and durable, you might be wondering why on earth you'd need to do anything else to the timber. What you need to remember here is that though pressure treating does stop rot from damp, it doesn't protect the wood itself against weathering (which doesn't always mean damp!). Just as an example, the next time you go to the garden shop take a look at the stacks of pressure treated lumber they keep there. You'll see that some pieces are cracked or warped. This is because pressure treated wood is bundled whilst still damp, and the pieces that were on the outside of the bundle dry too quickly in the sun and therefore get damaged. What you need to do is prevent this from happening, which is why correct treatment is so important. The bottom line is that even pressure treated timber will crack or warp if not taken care of properly, which means that little bit extra you paid to get wood that was treated to last longer will be a complete waste. You have three basic options for care and maintenance of pressure treated wood: stains, sealants, and paints. You may also choose to oil wood, which is fine and will give wood a glossy glow, but that doesn't mean you can skip the preservative stage. Any preservative, whether that's stain, sealant, or paint, will slow down the drying process and help keep your wood supple and straight. Sealer: Basically, sealer is a kind of oil that acts to stop the treatment process. Wood that comes out of the factory is already treated, yet those chemicals used to treat it will continue to act on the wood until it has completely dried out (something that can take months). A sealer will give you the greatest level of protection, and should be applied as soon as possible and then reapplied once a year. Look out for sealers with UV protection, since these will help protect your furniture against the sun. Stain: Unlike a sealer, stain will actually colour the wood that you use it on. There are two kinds of stain, latex and oil, and you can really use either. You don't have to apply a stain if you don't want to, but as well as making your furniture look a little nicer a good stain should also include a water repellent and more UV protection, increasing the life of your furniture even more. Stain can only be put on dry wood, so you should wait a month or so after purchase before staining to ensure that your pressure treated timber is truly dry. Paint: Finally, you may also paint your wood if you like. If you want to paint it's important that you first use a sealer. Check the instructions on the sealer you choose and they will tell you how long you need to wait before painting (at least several days, probably longer). Use a good oil based primer first, and then a couple of coats of latex topcoat.